Workplace stress can often extend beyond the confines of the office to affect consumers’ home lives. While harmful and abusive practices like binge drinking or drug use are all too common, one vice that may not get enough attention is overeating. Eating too much over a short period of time comes with a host of health risks, including diseases like diabetes, heart disease, and kidney disease. However, researchers from Michigan State University say there is a cure for overeating: get a good night’s sleep. "We found that employees who have a stressful workday tend to bring their negative feelings from the workplace to the dinner table, as manifested in eating more than usual and opting for more junk food instead of healthy food," said study co-author Chu-Hsiang Chang. "However, another key finding showed how sleep helped people deal with their stressful eating after work. 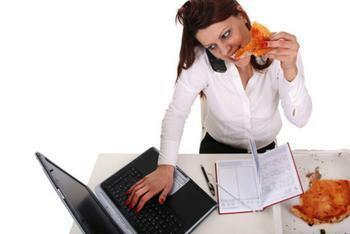 When workers slept better the night before, they tended to eat better when they experienced stress the next day." The researchers analyzed two studies involving 235 Chinese workers who either regularly experienced a high workload or expressed high levels of stress stemming from having to deal with rude or demanding customers. Findings from the studies showed that the negative feelings associated with participants’ jobs often led to unhealthy eating habits when they went home at night. Study co-author Yihao Liu explains how this behavior has two potential explanations. However, the researchers found that participants who received a good night’s sleep were better prepared to handle the stresses of their jobs the next morning. As a result, they were also better to regulate what they ate at night and reduce overeating and unhealthy eating habits. "A good night's sleep can make workers replenished and feel vigorous again, which may make them better able to deal with stress at work the next day and less vulnerable to unhealthy eating," said Chang. The researchers recommend that companies reconsider food-related job benefits in an effort to combat overeating and unhealthy eating habits. They say that these perks can often temporarily offset work-related stress, but they also reaffirm that more comprehensive solutions to reduce sources of stress are necessary for long-term health. The full study has been published in the Journal of Applied Psychology.